The right-wing press in the UK have finally taken to telling out and out lies in their campaign to smear the NHS. In fact, the contaminated drips were supplied by a private company called ITH Pharma. 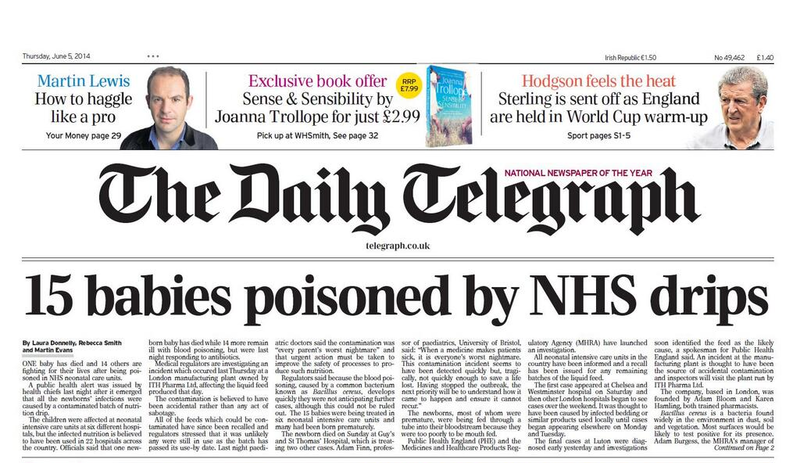 But Donnelly and her sick colleagues at the Telegraph have no qualms about using such a tragedy – and outright lies – to continue their political point-scoring in support of the coalition government’s commercialisation of the NHS. Well done Laura. You’ve managed to drop below even my extremely low expectations of gutter press hacks when it comes to decency. I’ve just got one question for you Laura. Big thanks to @thisisamy for the heads up on this. Please feel free to tell Laura Donnelly and the Telegraph what you think of them. In answer to your question, how do people like this sleep at night, is, very well thank you, they have utter contempt for the masses. When are the masses going to get the message? Nail head hit Tom, it’s not only the private companies directly though they have c diff in private nursing homes send the patient to hospital and the cliff levels at the hospital go up who gets the blame and the fine from the CCG’s, I give you a hint it isn’t the nursing home where the infection originated. It’s just what I’ve come to expect from the Telegraph. They’re also very adept at distorting (lying) about the hunting issue. i wonder if the Barclay twins in that company. i wonder if the Barclay twins own shares in that company. Isn’t that exactly what the article says? People who only read the headlines have no wish to be informed. Is there anything left of the NHS which is in public hands? Bit by bit it has been siphoned off so that politicians can give a nod to their corporate friends and relatives how to make a quick buck by offering commissions. Exactly what is there to defend? How about dealing with the public/private partnerships which are at the root of dismantling the NHS as it was first established. Mass media, whether right wing or not, is the monopoly of a mere six billionaires: Rupert Murdoch, Rothschilds, Rockefeller, Bronfman, Newhouse and Redstone. It is not necessary for any of these six billionaires or their employees to resort to lies when writing about the inadequacies of the NHS – the NHS is its own worst enemy when it comes to proper healthcare. Over and over again I must fly abroad for healthcare because of the perverse incentives in the NHS where GPs are paid up front each year according to the numbers on their rolls, then are reluctant to diagnose correctly or refer patients to specialists for the simple reason that the money literally comes out of their pot. Government can’t do healthcare any better than it could do it in the Air Force. Worse, corporations are creatures of the state and as such behave as bureaucratically and inefficiently as their parent, to whom they often go running for protective tariffs, regulations, bailouts and sometimes wars. In a free market, there are no corporations – only government can create them by declaring the owners no longer liable for their actions in the marketplace but instead an artificial person, the corporation, will be liable. What an Orwellian ruse! Government and their corporations are the problem, not the solution.